Tia & Tamera is an American reality television series on that aired on the Style Network from August 8, 2011, until September 22, 2013. Originally titled Tia & Tamera Take 2, the series started off as a television special that aired on July 17, 2010. It was announced in February 2011 that the special was picked to series. Later, the series was changed to its current title and debuted on August 8, 2011, on the now defunct Style Network. In September 2011, Style Network renewed the show for a second season, which later premiered on June 11, 2012. Season 3 was announced on February 12, 2013, with it premiering on July 14, 2013. The third season concluded September 22, 2013, and was the last program to air on Style, which re-branded as Esquire Network the next day. Tia & Tamera began airing on E! starting October 15, 2013, along with former Style Network series Giuliana and Bill. Tia and Tamera Mowry announced on December 30, 2013, that the series will not return for a fourth season. Tamera is a host on the daytime talk show The Real. Tia starred in the sitcom Instant Mom. The series goes inside the lives of celebrity identical twins Tia and Tamera Mowry as they balance their acting careers with major life transformations of marriage and motherhood. With her twin sister, Tia, by her side, Tamera became a teen TV star thanks to her work on the wildly popular comedy series Sister, Sister. She continued to act and produce while pursuing a psychology degree at Pepperdine University. Other credits include Double Wedding (an onscreen reunion with Tia), Roommates, and Strong Medicine. Tamera married Fox News correspondent Adam Housley in May 2011. The couple confirmed that they were expecting their first child in April 2012. Tamera gave birth to a son named Aden John Tanner Housley on November 12, 2012. Tamera and Adam Housley welcomed their newest bundle of joy Ariah to the world on July 1, 2015. Tamera is getting ready to marry the man of her dreams, and her twin sister Tia is pregnant with her first child. The sisters are struggling to find time for one another amongst all the chaos, and Tamera doesn't think Tia is fulfilling her duties as her maid of honor. Tamera wants to give her best friend Andrea the official title, but Tia won't relinquish her spot without a fight. Plus, Tia's morning sickness lands her in the hospital. As Tamera prepares for her bachelorette weekend in Santa Barbara, her excitement turns to disappointment when Tia tells her she is too pregnant to party and may miss out on the festivities. Then, a follow-up meeting with celebrity wedding planner Mindy Weiss stresses out Tamera because she's thousands of dollars over her original budget. Meanwhile, Tia has a tough time deciding on a birthing plan and whether or not she will give birth at home or in a hospital. With just a few days to go before her Napa destination wedding, Tamera stills has lots to do and she's feeling overwhelmed. Instead of focusing on helping her sister, Tia has plans to use Tamera's wedding weekend as a romantic babymoon getaway for her and Cory. When the drive takes much longer than planned, she isn't able to make time for her and Cory or her sister. Meanwhile, Tamera fears her dream wedding will turn into a wet disaster when the forecast calls for heavy rain on her big day. Newlywed Tamera returns from her honeymoon and has her mind set on becoming the perfect wife, so she takes a cooking class and attempts to do her hubby Adam's laundry. Things don't go exactly as planned, and she starts to question her domestic skills. Meanwhile, the sisters finally vent their frustrations to each other regarding the wedding weekend, but Tamera is left in tears when emotions boil over. Also, Tia tries everything to get her baby to turn the right way for delivery, as it's in the breech position. Now that they're married, Adam finally moves into Tamera's house, but Tamera has a hard time learning how to share her space with her new husband. She turns to her friends and therapist for advice, and eventually enlists the help of an interior designer to help merge her and her hubby's different decorating styles. Meanwhile, Tia's baby remains in the breech position, and she must decide whether or not to try a risky treatment to turn her baby around. Plus, Tia gets emotional at her baby shower and continues to become more self-conscious about her weight. With two weeks to go before her scheduled C-section, Tia's doctor puts her on bed rest, forcing her to wait out her remaining days in her home. Unable to do much, Tia is overwhelmed by all the things she still needs to do and hires a high-profile designer to decorate her baby's nursery. Meanwhile, Tamera prepares herself to re-enter the acting game after taking six months off to plan her wedding and enjoy life as a newlywed, but first she must tackle her anxiety about venturing out of her comfort zone of comedy by attempting darker and more dramatic roles. Tamera gets a call from her manager asking her to co-host Access Hollywood. After mulling over the idea, Tia convinces Tamera to take the gig—but when she finds out the show is taped live, her nerves really kick in. Meanwhile, Tia is under doctor's orders to remain on bed rest until her scheduled C-section—but she stresses out over a laundry list of things to take care of before the baby's arrival. When Tamera offers to help her out, it's both a blessing and a curse. Plus, Tamera gets inspired to do something nice for the armed forces, and Tia and Cory struggle to find a pediatrician who shares their same beliefs on infant vaccinations. Tia finally gives birth to her son Cree and adjusts to life as a new mom. She quickly becomes overwhelmed when she only has weeks to move her family to Atlanta where she will begin shooting a new season of The Game, find a new house and shed her baby weight in order to be camera-ready! Meanwhile, Tamera starts thinking about starting a family of her own, but wonders if she may be jumping into it too fast. The second season begins with Tia struggling to be a full-time mom and Tamera trying to split her time between her Napa home and Los Angeles without hindering her career. The girls travel to New York City, where Tamera struggles to present a more grown-up image of herself to fashion-magazine editors. Meanwhile, Tia sets out to prove to her sister that moms know how to have fun. Tamera struggles to find balance between her life in Los Angeles and her new home in Napa. Tia's "to do" list overwhelms her before she leaves to make a movie. Tia's work schedule causes her to miss an important motherhood moment. Tamera burns the candle at both ends as she decorates her Napa home and auditions for TV pilots. Tamera and Jerome visit Tia in Utah and give her the family support she needs while she's making a movie and trying to be a good mom for Cree. Tia teaches Cree baby sign language, and Tamera prepares to deliver a speech to high-school students. Meanwhile, the sisters seek professional help to better communicate with each other. Tamera considers moving, and Tia struggles with her body image. Later, the twins mentor young performers during a fashion fund-raiser. Tamera prepares for a housewarming party. Tia deals with separation anxiety when she leaves Cree for the first time. Tamera treks to South Africa, where she faces wild animals via a safari and dives with great white sharks. An exciting discovery comes Tamera's way, but she must keep the big news a secret. Meanwhile, Tia anticipates her first Mother's Day, but preparations for her inaugural book tour cause complications. Tia faces a big decision about her role on The Game. Tamera struggles with being a working mom when she begins shooting a television movie. Tia plans a birthday party for Cree. Tamera tries to determine if her dog is sick when it starts acting strange. Tamera opens a shop to benefit a local charity. Meanwhile, Tia struggles with posing for a bikini photo shoot and tries to find a solution to Cree's restless sleeping patterns. Tia plants a garden and receives an unexpected job offer. Tamera hires a doula as she plans for a natural childbirth. Tia plans a baby shower for Tamera. Later, Tamera brews a lactation tea. Tamera gets involved with Jerome's recording session and builds a baby nursery. Meanwhile, Tia makes a yoga video. Tia and Tamera comment on their favorite moments from the series. Tia and Tamera work on a lactation drink. Tamera worries about postpartum depression and debates whether or not to post pregnancy pictures of herself on the Internet. Tia takes a provocative dancing class to keep the fire alive in her marriage. Tamera plans a final night out with the girls before the baby is born. Tamera prepares for her baby's arrival, but fails to involve her sister in last-minute preparations while Tia gets bad news about her television project. Highlights from the show's first two seasons. Tamera works with a friend to create a sitcom. Tia goes to a red-carpet event while she waits for news regarding her pilot. Tia is a little offended when an employee at a yogurt place called her ma'am. Tamera receives a call from her publicist saying that she was invited to Vegas for a celebrity poker night for charity. Tia and Tamera decide to have some girlfriends come over for a night of poker fun. Tia is also invited to participate in a burlesque show. Tamera doesn't think it's a good idea, especially since Tia is dancing in front of other men while married. The twins and their girls go to Las Vegas for a weekend charity poker game. Tamera's husband has an event the same day as Tia's poker game. Tamera wants to support Adam and be by his side for such an important time in his life. While in Vegas, the ladies attend rag Shows, eat at buffets, and hang out by the pool. Tia finds out that her pilot for a show on NickMom has been picked up. She also finds out that Tamera may start on a project with a good friend. During the charity game, Tia and her friend who stepped in for Tamera make it to the second round of the tournament. The charity raised $100,000 dollars. Tamera is forced to skip Tia's celebration party for her pilot when she encounters health issues. Tia and Jerome go out for an adventurous zip lining trip. Tia works to give Tamera's closet a makeover. Tia becomes unsatisfied with her weight after some images are posted on the internet, which leads to her signing up for a weight loss boot camp with Tamera and Jerome also taking part. Tia wants to have another child, but fears the time may not be right as she prepares to begin work on her new series. Tamera faces stiff competition at an audition for a talk show. The sisters have differing opinions on how to handle their maternity brand. Tia plans her will and visits a fertility specialist. Tia takes a DNA test when Tamera suspects she and her sister may not be identical twins. The sisters disagree on a scent for a new product. At the end of the episode, the DNA test confirms that they are identical twins. Tamera must make some difficult changes when her talk show is picked up. Tia takes part in an ad campaign for an animal-rights organization. Tamera worries about making her voice heard among the four co-hosts of her new talk show. Tia misses Cory while she works on her sitcom. At the time, the series premiere was the most-watched series premiere for Style Network and the second most watched Style Network telecast ever in key demos. The episode averaged 1.5 million viewers for its combined two airings. The second episode climbed to new highs with 920,000 viewers and a 0.5 rating in adults 18–49 demo. The first season was also Style Network’s most-watched original series, at the time, by acquiring 775,000 total viewers. 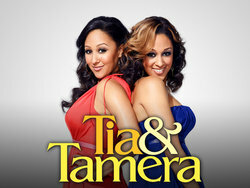 At the end of July 2012, Tia & Tamera averaged 450,000 total viewers during its second season. The third season premiered with 491,000 viewers. ^ Castina (June 29, 2010). "Tia & Tamera Mowry Reality Special Style Network July 17". PopCrunch. ^ "Style Network Teams Up With Stars Tia and Tamera Mowry to Chart Their Major Life Changes in New Docu-Series "Tia & Tamera Take 2"". The Futon Critic. February 10, 2011. ^ a b "Tia and Tamera Mowry Embark on Major Life Transformations in New Series "Tia & Tamera," Premiering Monday, August 8 at 9PM ET/PT on the Style Network". The Futon Critic. July 6, 2011. ^ Nededog, Jethro (June 23, 2011). "Tia and Tamera Mowry's New Reality Series Premieres August 8 on Style". The Hollywood Reporter. ^ "Style Network Picks Up No. 1 New Docu-Series "Tia & Tamera" for Second Season". Retrieved November 16, 2012. ^ Andreeva, Nellie (September 15, 2011). "Style Renews 'Tia & Tamera' For Season 2". Deadline Hollywood. ^ Kondolojy, Amanda (February 12, 2013). "Style Renews 'Giuliana & Bill' & 'Tia & Tamera' + Announces New Series 'Pop Style', 'Lifestyles of the Rich and Famous', 'Luxe Life Miami' & More". TV by the Numbers. ^ Kondolojy, Amanda (June 6, 2013). "Top-Rated Docu-Series 'Tia & Tamera' and 'Giuliana & Bill' Return With All-New Seasons This July to Style". TV by the Numbers. ^ Kondolojy, Amanda (September 26, 2013). "E! Debuts New Tuesday Lineup with 'Tia & Tamera' and 'Giuliana & Bill' Starting October 15". TV by the Numbers. ^ Webber, Stephanie. "Tia and Tamera Mowry End Reality Series, Tia & Tamera, After Three Seasons". Us Weekly. Retrieved January 3, 2014. ^ Sister, Sister's Tia Mowry Is Pregnant!. Usmagazine.com. Retrieved on July 5, 2011. ^ Actress Tia Mowry Reveals Her Baby's Gender – Moms & Babies. UsMagazine.com (August 25, 2009). Retrieved on February 5, 2011. ^ Blog Archive » Cory Hardict & Tia Mowry Decided On A Name For Their Little Boy Archived 2011-07-03 at the Wayback Machine. Media Outrage (June 30, 2011). Retrieved on July 5, 2011. ^ "News: Tamera Mowry-Housley and Husband Adam Welcome Their Son!". Style Network. Nov 11, 2012. Archived from the original on 2012-11-18. Retrieved 2012-11-17. ^ Seidman, Robert (August 9, 2011). ""Tia & Tamera" Shatters Records Delivering Most-Watched Series Premiere Ever for Style". TV by the Numbers. ^ Seidman, Robert (August 16, 2011). "Monday Cable: 'Pawn Stars,' Jets-Texans, 'WWE RAW' Lead + 'Closer,' 'Rizzoli,' 'Warehouse 13' & Much More". TV by the Numbers. ^ Seidman, Robert (October 4, 2011). "'Tia & Tamera' Season Finale Tops Record Breaking Premiere + 'Big Rich Texas'". TV by the Numbers. ^ Bibel, Sara (July 31, 2012). "Style Media Delivers Best July Ever Across All Key Demos". TV by the Numbers. ^ Seidman, Robert (July 17, 2013). "Style's 'Giuliana & Bill" Delivers Most-Watched Premiere in Series History". TV by the Numbers. Archived from the original on 2013-07-23. Retrieved July 31, 2013.